Outside of the prison, the Governor finds Hershel and Michonne disposing of the walkers from the last attack on the prison. Just before they finish up, he pops out of the bushes and overtakes both of them. Returning to the camp, he addresses his new people and tells them about the prison. He tells them that he has captured two of the prison inhabitants and tries to motivate his people to overtake the prison. While he promises that they can do it without killing anyone, he tries to prepare them for a possible war. Lily confronts him and tells him that she is concerned for his determination to take the prison. While he confesses his love of her, she remains concerned for their safety and about the possibility of killing people. In the trailer, the Governor addresses Michonne and Hershel. While the Governor tries to claim that no one will die, Hershel tries to mediate his concerns for the violence that he projects is coming. Saying that he can sense the Governor is ready to kill for the prison, Hershel pleads with him that he should not kill someone else’s daughter if he understands what that feeling is like. Shaking off the comment, the Governor replies that the girls are not his so it is not his concern. Meanwhile, Michonne is chomping at the bit to kill the Governor and even says it multiple times to pull a reaction. Continuing to claim that his intentions are to protect her and Megan, Lily continues to express her concern as well. He approaches Megan and hugs her before he heads out. Lily, watching in the distance, appears to be struggling with the situation. Back at the prison, Glenn seems to have improved but is still bed-ridden. Talking with Maggie, they chat about the idea of taking a vacation together. Daryl and Rick are off in another part of the prison arguing about Carol’s disappearance from the prison. Noticeably upset, Rick continues to explain that he sent her away with the threat of Tyreese’s anger and Daryl thinks about the two girls she has cared after. They decide to go officially tell Tyreese. Sasha and Bob talk about how Hershel helped to save them from the flu, but Bob refuses to take any credit. When Rick and Daryl find Tyreese, they find a dissected rat. Tyreese claims that he believes the same person who killed Karen was responsible for the rats, but they are interrupted by a loud explosion. Rick loses his chance to tell Tyreese about Carol. 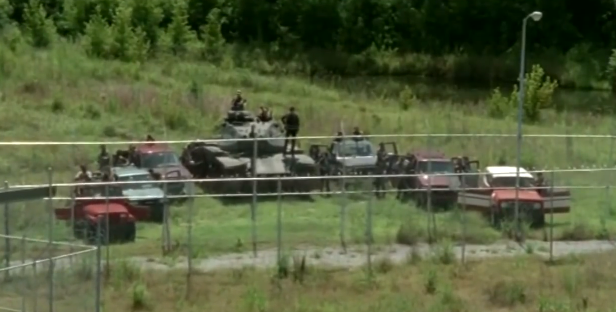 The entire group goes out to the fence and find the Governor and his new people (including a tank) outside the prison walls. The Governor yells for Rick to come down and shows them that he has Michonne and Hershel as prisoner. While Rick keeps shouting about the council making decisions, the Governor forces him to come down or lose his people. He gives the ultimatum, but Rick continues to plea for something else. The Governor lets his know that they leave by sundown or the captives will be killed. Back at the camp, Lily watches a walker walking across the river while Meghan calls for her attention. The walker ends up getting swept away. Megan pulls a sign up from the mud but also uncovers a walker, who bites Meghan on the shoulder before Lily can get her gun off. The Governor continues his convincing of Rick to just pack up and leave, blasting away two walkers. Back in the prison, Daryl and the rest of the group are armed and ready to defend if necessary. Rick tries again to plea, saying he is willing to live together in different cell blocks. The Govenor refuses to listen and pulls Michonne’s sword on Hershel. Rick tries to invite them in to live together and plead for no one to have to die. The Governor refuses to listen and uses the sword to slash Hershel in the neck. Immediately, a huge battle ensues with both the Governor and Rick taking a bullet. While the chaos rises, Michonne rolls away and frees herself while also killing one of the Governor’s people. Hershel tries to crawl off but the Governor finds him and finishes the job. Tara drops behind the tank and refuses to pick up her gun to fight. At this point, Lily walks up to the Governor with Meghan’s dead body and he draws his gun to shoot Megan in the head. Yelling to his people, he orders a full assault on the prison. They take down the first fence, but the prison continues to defend themselves without additional loses. The tank begins to fire on the prison. Daryl and the rest of the group run for the bus. Maggie goes to run for Glenn and leaves Beth with the bus and to protect the children. Rick surprises the Governor from behind the bus and the two find themselves in a fist fight. Daryl almost gets taken by a walker but kills it and uses it as a shield. While Maggie finds Sasha, she continues to on the search for Beth, who has gone looking for Judith. With Rick on the ground and the Governor almost stealing his last breath, Michonne shows up and stabs him from behind through the chest. Daryl gets up to the tank and tosses in a grenade, flushing out Mitch and shooting him with his crossbow. As Rick stumbles up to look for Carl, a couple of walkers come barreling down toward him. Carl pops up and shoots them both. They come across Judith’s baby carrier with only blood stains inside. Lily walks up on the still-breakthing Governor and puts a bullet in his head. Carl and Rick limp out of the prison as Rick says to not look back. Reaction: Well, the death of Hershel did not come so quickly as the preview and the end of the previous episode seemed to project. Instead, he got his opportunity for his swan song. He took on multiple opportunities to convince the Governor to end the attack but was unable to convince someone who, as the title of the episode highlights, was too far gone. Unlike the Governor, Rick’s words before Hershel’s death struck a chord with the father of the prison group. Rick used a speech to convince the Governor to stop the war by saying that people are allowed to come back. This put a smile on his face before taking the sword to the neck. The loss of Hershel means the loss of another moral center for the group, which means that the survivors will need to regroup. This brings us to the Governor. He was definitely too far gone from the start of his return this season. In particular, this episode was his swan song too, but more so in a blaze of glory. Capturing Hershel and Michonne was similar to the events of the comic, except that it was Tyreese instead of Hershel. Parading them out in front of Rick and the prison, he looked to make a statement regarding his intentions to take over, but there was a clear hint to the people of the prison that it would not be so easy. Even if Rick had agreed to leave, it is unclear if there would have been the type of mercy that the Governor expressed. Killing Hershel was a sign to show that he was serious and wanted to seriously kill the people of the prison, as also symbolized with no care for shooting the dead Meghan in the head. The Governor was giving up from trying to “come back” to a sense of humanity that Rick tried to persuade him with. The death of the Governor was very satisfying, but there was a question with who was going to get to do the deed. There were plenty who had the reason to take him out. Maggie and Glenn were imprisoned by him. Michonne lost Andrea to him. Daryl lost Merle to him. Rick’s safety and security was threatened by him. Lily was worried over her safety because of him. Mitch lost his brother to him. Hershel was captured and threatened by him. The Governor’s list of enemies was truly long, but Lily was the best choice and the sequence allowed for some added enjoyment of the process. Lily shooting him in the end was very similar to the comic, where one of the women shoot the Governor in the head after she watches him kill Laurie and Judith. Rick got his licks in to start but the Governor got one more shot to kill Rick. Ultimately, Michonne thought she got her due by stabbing him in through the chest but walked away without confirming her success. Lily then walks in at the end and had come to the realization that the Governor was not going to keep them safe. In the chaos of the attack, people scattered in multiple directions. Even though there was a solid group of people on the bus near the end, the only two that we knew the status of were Rick and Carl in the woods. The bus left but never confirmed who stayed on, Maggie was out chasing after Beth, Daryl had run off with Beth trailing behind him, Michonne wandered away from Rick, and Sasha, Tyreese, Bob, and the girls were not at the bus yet. There were actually still gunman from the Governor’s camp that seemed to be around, meaning that there were still others that could be in danger (besides against the walkers that had flooded into the prison). Judith was actually also never actually confirmed as dead, but Rick and Carl believed it to be true with the bloody baby carrier on the ground. Beth could have stepped in and taken her away. There will be a lot to sort out at the start of the second half of the season. There were several characters that grew up in just this episode. While it is unclear if Lily will be back, she went from being unable to defend herself to finishing off the Governor. She initially relied on him to make decisions and protect her but had realized that he was not thinking for their best interest when he showed seeds of the maniac below his surface. When he shot Meghan without thought, that was the final straw. His group will never truly know about his deeds against Pete and Martinez, but she made sure that he would never hurt another else. Carl has gone back and forth through the show, but he showed maturity in the protection of their people and his father. Stepping in to shoot the walkers after Rick fought the Governor and helping Rick stumble away from the prison, Carl showed his protective instinct. Lizzie, who apparently listened to the training by Carol, armed the other children and actually ended up in the fight, killing Aisha without thought. She may have problems later on, but we will have to wait and see. One other element of the episode that ended up falling behind the other major developments was the confrontation with Rick and Daryl about Carol. It was a little unsatisfying because they are in the middle of the argument when it cuts to them, but Daryl does seem to have a problem with Rick’s decision. While he was very close with Carol, it is hard to get a sense of how upset he really was about the decision. Rick explained the piece about Tyreese and how he confirmed Carol’s responsibility for the charred bodies, so Daryl may have understood the somewhat protective element of Rick’s decision. They go together to tell Tyreese but never get to the decision. That reaction will have to wait until later but it certainly will have a chance at being explosive. Others will have to finally start asking questions and Rick may not have to be the one to tell him. At this point, Maggie and Daryl know about the decision and may have to be the ones to break it to the rest of the group. So Carol did not reemerge, the rats were reintroduced but not explained, Rick was interrupted before telling Tyreese about Carol, and the group has been scattered both in and away from the prison. Most of the favorite characters will return for the second half of the season, but we had to say goodbye to Hershel. This was a very sad but satisfying episode that will be re-watched many times before the show returns on February 9th. I will return with Blogging Dead in February but may have a couple of Walking Dead-related posts leading up to the second half of the season. Stay tuned and send me your predictions.